When it comes to fresh peaches, I am hooked up! My brother and sister-in-law have a crazy producing peach tree along with some of our generous neighbors (love you all!). Since peach season comes and goes oh so quickly in the Fall, I stock up. I’m actually surprised that I have any leftover to freeze because I cannot contain myself from eating dozens at a time. Oh, I love biting into a ripe peach and having the juice run down my chin despite attempting to eat like a civilized person. Okay, back to the cobbler. 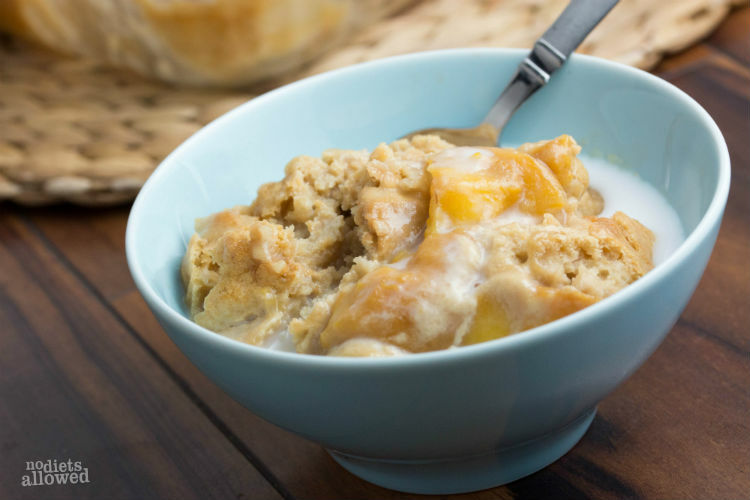 Even if you don’t have an abundance of peach trees around you, thank goodness frozen peaches are available all year long. Since peaches have a thin skin which don’t protect the fruit well enough from pesticides, I recommend purchasing organic peaches. Also, there is no comparison for the fresh-from-the-garden taste of organic produce. Also, I would be doing you a disservice if I didn’t mention whole wheat pastry flour…. again. 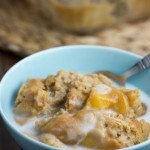 It really makes this peach cobbler recipe light and fluffy without skipping out on nutrients. You would think I’m running an illegal scam with how much I promote this flour, BUT I promise I’m not getting paid off for my opinion. I really do use it in everything! My miracle whole wheat bread, blueberry waffles, and Banana Zucchini Muffins are just a couple of many recipes where I’ll help you fall in love with whole wheat pastry flour. If you can make a recipe healthier without compromising taste, why not? Instead of cool whip or whipping cream, try scooping on my blender ice cream or pouring on some coconut milk. You’ll never know (neither will your family) that you’re substituting with a healthier option. 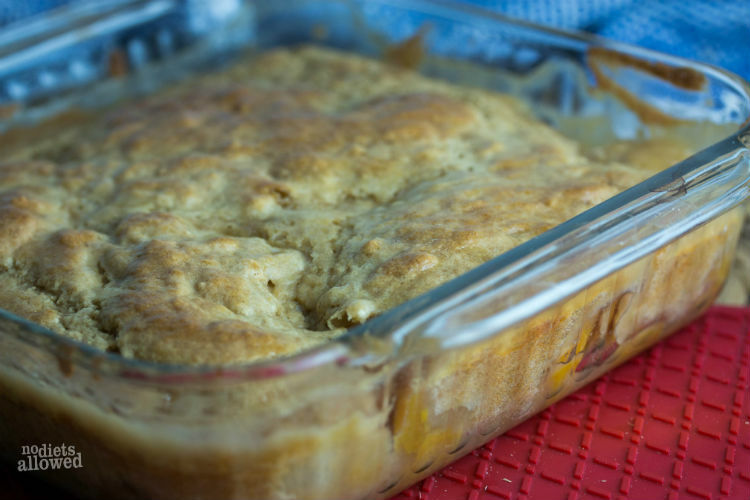 In a 8x8 glass baking dish, spread peaches evenly across the bottom. 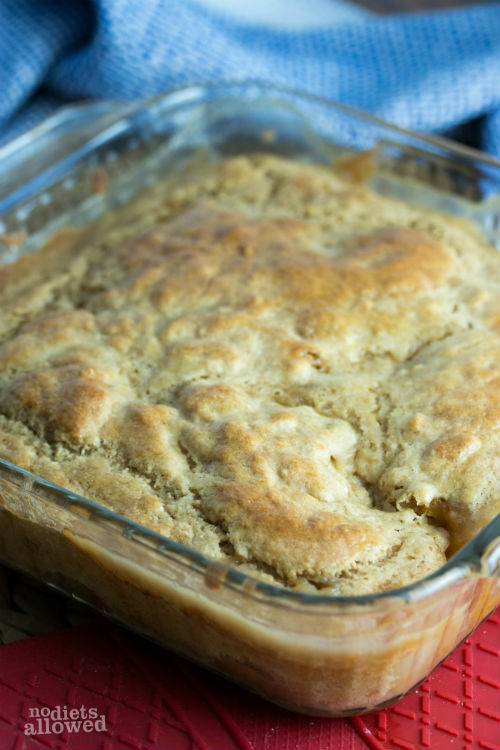 In a separate bowl, combine flour, brown sugar, baking powder, and salt. Mix well. Scoop batter over peaches and smooth until evenly covering the top. Bake for 35 to 40 minutes until golden brown. Enjoy with coconut milk poured over or a scoop of blender ice cream. Could you make this with thinly sliced apples instead? I have an easy apple crisp recipe, but it is very unhealthy. I would love to find a recipe to replace it. I think it would taste great with apples, Heather!